It's the common small space dilemma in the bedroom - where to put the bed? Too often, the balance of windows, available walls and space seems overwhelming. There definitely are tips you can follow for making your bedroom layout work and my fave - creating your own wall. Yes! By using curtains in the right places, you can actually reinvent the look and feel of this room and find a space for your bed. The curtains add balance to the space and allows you to place your bed, say, partially in front of a window. In other words - fake it! 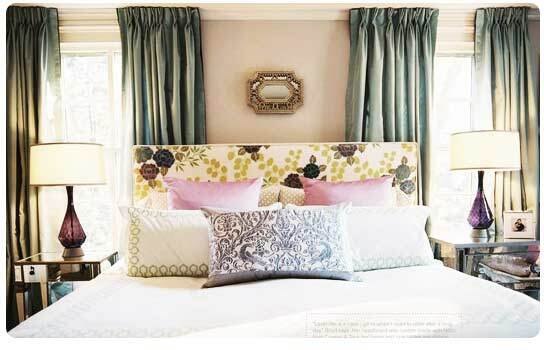 I love this pretty bedroom via Lonny. I imagine that viewing this room bare, you wouldn't imagine that the bed would work right here. By adding the symmetrical curtains (the height works too), the bed and headboard completely work and feels good. Check out another example about using curtains in one of my Apartment Therapy posts right here. Anyone have any creative ideas for creating a new wall in a small bedroom with an enormous air conditioning unit under the only window in the room?